The 2010 Shanghai World Expo hasn’t even begun yet but we’re already starting to see designs roll in for the 2012 World Expo in Yeosu, Korea! 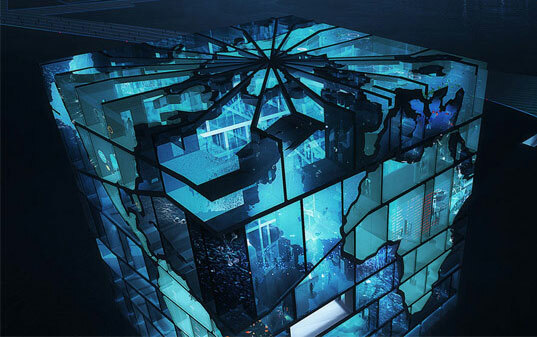 MVRDV just released plans for their own mesmerizing Water Cube pavilion, an H2O-filled structure designed to express the power and beauty of the oceans. The Water Cube’s structure is composed of water filled basins, which act as both a temperature buffer as well as the main attraction. A bit like being inside an aquarium, the hollow inner sanctum will be lit with water-filtered light, and will be used as an exhibition center during the Expo. 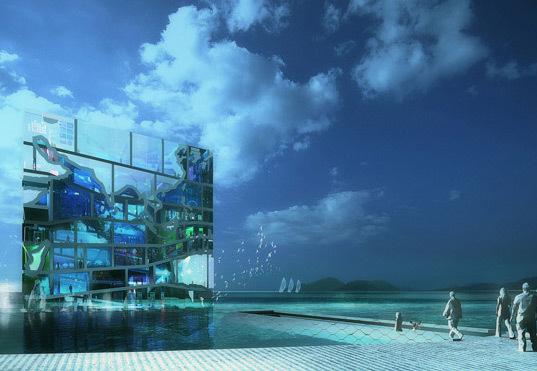 Korea’s 2012 Expo is centered around the theme of “The Living Ocean and Coast” and MVRDV’s pavilion will be an inspiring representation of the world’s oceans. Arranged like a world map, different basins represent the world’s oceans and continents, with the polar seas on the top and bottom and the tropical seas in the middle. Four layers of glass sandwich the water in between and from the outside the continents are clearly delineated. Sea water is pumped continuously throughout the basins to maintain circulation, and the ecology of the water. The glass basins also act as a temperature buffer from the outside conditions, and also represent the role of the ocean as a temperature modulator for the planet. The exterior of the structure also contains rolling curtains to control the UV penetration, while solar cells generate energy to help pump the water and provide lighting. After the Expo, the pavilion could be reused as a concert hall, theater, museum or even an office building. It’s certainly an extravagant building, but that is the point of World Expos – to design and build feats of wonderment, which is exactly how Paris got the Eiffel Tower. Also I humidity is more of a problem than heat in the Korean Summer. This implies that open facades and continuous air flow are important for thermal comfort. I wonder how they intend to ventilate the building? Water is a very effective thermal buffer and battery. Heat from the day can be released at night. However this would also be problematic in Korean summer, as the temperature at night is also quite high. This could lead to a heat build up in the interior. Still it looks incredible and I would love to experience it. Even it meant suffering a little. Perhaps it's just me, but the very idea of the expo seems to be unsustainable. I understand that the buildings *can* be reused, but how often are they actually reused? Do they typically find a new purpose, or are they torn down a few years later? I don't know that I agree that any significant monuments (on a par with the Eiffel Tower) will come out of buildings such as these. It seems that most monuments from previous world expos were feats of engineering, not of architectural design. Also, it would seem that continuously pumping sea water through the building's facade would have several negative impacts. 1) I would imagine it would take a fair amount of energy to do this. 2) The water will be warmer when it re-enters the sea, which could have a significant negative impact. Sorry to be a "Debbie Downer," but I really don't think this seems like a sustainable project at all. The 2010 Shanghai World Expo hasn't even begun yet but we're already starting to see designs roll in for the 2012 World Expo in Yeosu, Korea! 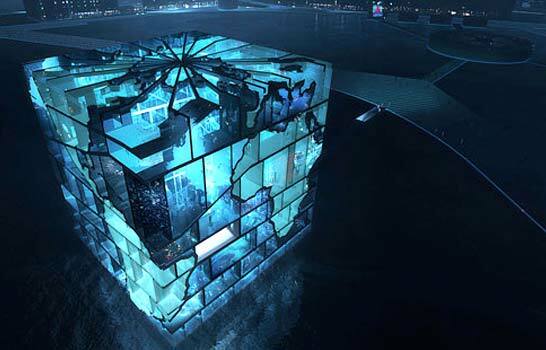 MVRDV just released plans for their own mesmerizing Water Cube pavilion, an H2O-filled structure designed to express the power and beauty of the oceans. The Water Cube's structure is composed of water filled basins, which act as both a temperature buffer as well as the main attraction. A bit like being inside an aquarium, the hollow inner sanctum will be lit with water-filtered light, and will be used as an exhibition center during the Expo.